Easycooking: From your blogs # 7..and mine too!! From your blogs # 7..and mine too!! What do you do when you are back from a week-long holiday/vacation and don’t feel like cooking anything new? ?Ahem..I decided to blog:).Well,I haven’t made anything new,just the daily stuff,so I dug up my drafts folder and found few pictures of the stuff I tried out from other blogs.I am bookmarking so many recipes daily,and I am happy that I am trying out at least a few..:). 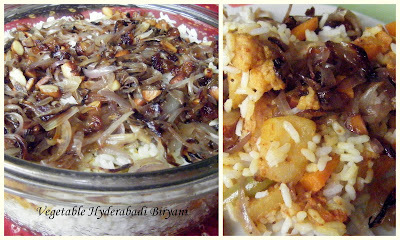 I have heard so much about Hyderabadi Biryani from my hubby and friends.Every time they talk about it,they rave and rave about the distinct flavor and pity me since I am missing out on the fantastic taste[since I’m a veg].While doing the Recipe Marathon,DK posted this yummy recipe with step by step pics[like all her recipes] and I was tempted to try it out.As usual,after a while I forgot about it.Once we had Veg Biryani at a friends place,we liked it so much that I had to recreate it at home.I chose DK’s recipe and fell in love with it.Lipsmackingly delicious,even my staunch non-veg loving hubby gave his thumbs-up!! They say its one of the easiest sweets ever..Strange that I never got it right the first few times I made it.Once I wrote down step by step recipe while ma-in-law was making it.It came out alright for a while and then again I lost the plot.When I saw Raaga’s recipe I liked the proportions she gave.Easier to remember and gets done pretty fast.Last week when I had guests at home,I made this Sheera and served it with Upma[which was our breakfast that day],it was a super duper hit!! I came across this recipe while searching for something else.The recipe sounded very simple and I was madly baking with yeast those days so I literally jumped out from my seat and made this.A mildly sweet bun which had us asking for more.Even though I played havoc with some steps[due to which the dough didn’t rise much]it came out excellent!! We love dates and it often is our after-food dessert.Sometimes,I insert a cashew inside the dates and it disappears as and when I am making it;).I have not much experimented with cooking with those except for this Superb Dates cake.It had been long since I made cookies so I decided on this one.It smelled divine inside the oven.Once again,a mildly sweet biscuit,perfect for snack-munching!! One of the first people who commented on my blog and one of those firsts to encourage me to do better,Bharathy is a sweetheart.Though she took a long-ish break when I started regular blogging,she comes out with such amazing recipes after each break:).I have tried out her Spicy Baby potatoes which Nags had also posted.I’ve been meaning to make the Chocolate Cake too,if only the two sisters gave me cup measures:).I made the Onion thokku a while back and it literally disappeared from the bottle.We had it with Dosa,Idli,Rice and Chapathi too and Bang,it was over..yummm!!! I feel nice when people tell me that they like my blog and they try out the recipes.I think that’s the biggest joy blogging gives me.I remember reading somewhere,how food blogs are different from cooking websites.They have an edge over websites coz you know the recipes come from another bloggers kitchen and they have been through the acid test to make your job easy. But still there are some people or anonymous commenters or sometimes even friends who tell..’hey,I tried out that recipe of yours..didnt come out so good’…! !Initially I didn’t know how to deal with them,but I think now I do.We bloggers give our time and energy to each and every post of ours and when people just rub it aside,my blood boils! !So to cool it down,here are some recipes from my blog which dear Purnima tried out.I haven’t come across someone like her.Every time a recipe appeals to her,she tries it out,gives feedback and sends me pictures too..such a darling!! 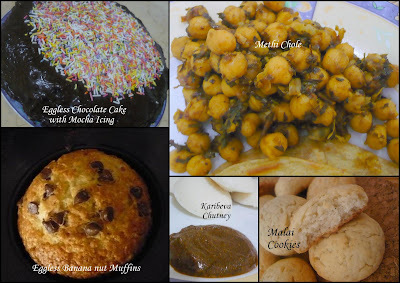 Clockwise from top-Eggless Chocolate Cake with Mocha Icing,Methi Chole,Malai Cookies,Karibeva Chutney and Eggless Banana nut Muffins. That is so sweet of you Divya! lovely creations! MMm totally yummy post with so many tried delights divya! Thats an immpressive list of tried recipes. Each one of the recipe looks delicious and tempting. Lovely to see ur creations tried in another kitchen too. That's so sweet. Even I am going to do something like this very soon. There are so many amazing recipes out there :) Onion thokku looks yumm! woo every dish looks awesome and mouthwatering..
all delicious treats together; nice work!